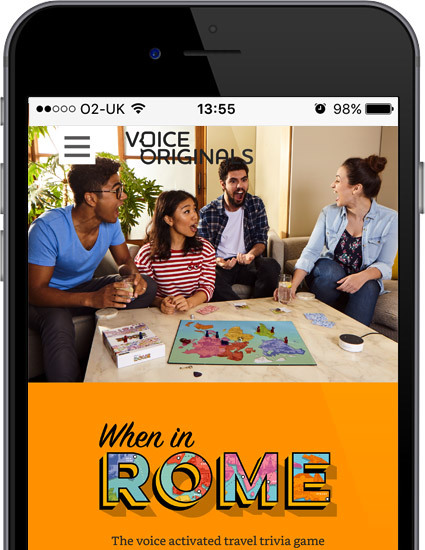 We designed the launch website for the When in Rome game so that Voice Originals could adapt it later, as more games became available. Every site we build we build runs on Content Management System, in this case WordPress with an entirely custom built, responsive design theme. The custom wordpress theme we created for Voice Originals’ When in Rome website had to allow for a lot of adaptability as their stable of games is certain to grow. Several different page templates were required with different features including audio & video playback. Our custom WordPress theme design will enable this innovative game company to expand their offering in future, while ensuring their content is always displayed elegantly on across the different screen sizes of mobile, desktop & tablets. When in Rome is the first game from the people at Voice Originals. An innovative voice-activated, travel trivia game, When in Rome launched on Amazon’s Alexa in mid 2018 and the game should be available on other voice activated platforms including Google Home early 2019. More voice activated games are in the pipeline from Voice Originals.